AWANA is a Christian club where children and youth meet to have fun, memorize Bible verses, learn Bible stories, develop leadership skills and make new friends. Our Clubbers will enjoy games, puppets, crafts, awards, snacks and other age appropriate activities to make each club a lively weekly experience where fun and learning go hand in hand. Clubbers display their awards on their vest uniforms, which they wear to club each week. A commitment of one dollar per week per child is requested of each clubber which may be brought each week, monthly or $30 for the year. WHERE: Sierra Baptist Church, 2215 Auburn Folsom Rd., Newcastle, Ca. Puggles recognizes the learning ability of 1- and 3-year-olds by introducing biblical precepts at church and equipping parents to teach them at home. 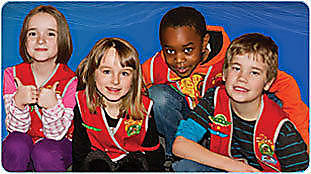 Toddlers love having their very own AWANA club just like their older siblings.